Just to say a big thanks for helping to make last night a huge success. You were professional and friendly and helped to make all of our guests feel welcomed. We would certainly recommend your services. We booked Max for a Casino Royale themed event in the summer and were extremely happy with his services. Not only did he look the part, he was also a pleasure to deal with and extremely professional. I would not hesitate in recommending him to anyone holding any Bond-themed event. Max was the perfect addition to our James Bond themed event. He had the Daniel Craig looks, the charm and even the gun – the best lookalike I’ve ever seen! Max made Graham’s dream come true – his one wish was to have James Bond at his party and Max made that possible. Max was totally committed to giving a great experience to Graham and was reliable and flexible around arrangements for his 50th birthday party. The party went with a bang and the memories and experience that his visit provided are priceless – the smile on Graham’s face whenever he recalls it is wonderful – thank you Max! I found Daniel Craig Look Alike via searching the internet and at that time remained cautious in making a booking via email which if did not work out would absolutely destroy a main feature of our party. All I can say is Daniel Craig Look Alike is a true professional, he communicated well and delivered on his promise and I would not have any hesitation in recommending him to anyone. A BIG THANK YOU for such a wonderful night. Everybody said how great you were. Max played a blinder and everything went so well it was untrue.” “It was an absolutely amazing night. You were absolutely excellent on every level. A true professional in every way. Thanks for making the long trip to ‘Geordieland’ to make Helen’s night a truly memorable one. James Postlethwaite, stand up comedian, Softworks Live Media. Splendid job Mr Bond, a very professional performance and so convincing. Thank you for taking time to mingle with guests and pose for photo’s after the party. Thank you so much for a wonderful evening.’Kind regards. The event was professional and our client has commented that it was the best they got in 12 years… !! So good for us . ‘’The closest to the real thing I’ve seen so far. 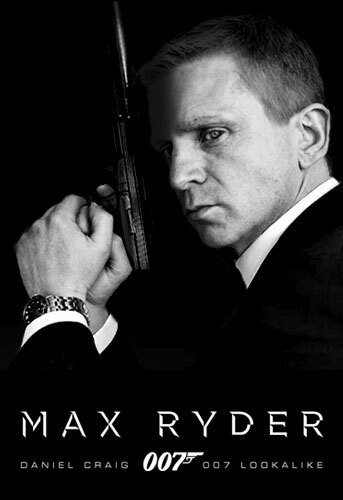 You really look great James..I mean Max; the spitting image of Daniel Craig.